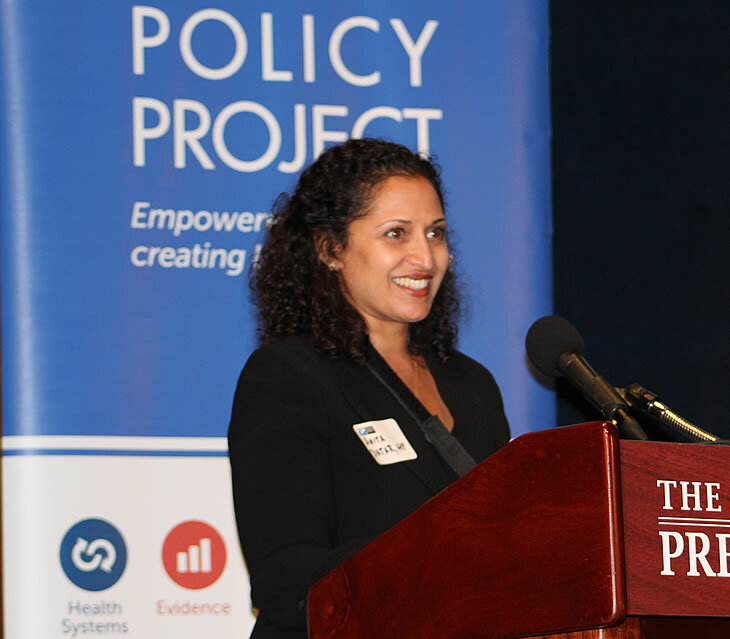 WASHINGTON, DC—The USAID- and PEPFAR-funded Health Policy Project (HPP) held an “Innovation Exchange” on October 23 to mark the project’s conclusion, and to share results from the five-year effort to improve health systems in developing countries. The event brought more than 150 people to the National Press Club to hear from global health experts at USAID, HPP, the U.S. Department of State, the health ministries of Kenya and Tanzania, the World Bank, the Center for Strategic and International Studies, and various nongovernmental organizations and partners. Jennifer Adams, deputy assistant administrator of USAID’s Bureau of Global Health, offered the morning’s keynote address. The morning schedule also included a panel discussion moderated by J. Stephen Morrison, senior vice president and director or the Global Health Policy Center at the Center for Strategic and International Studies. Joining Morrison on the stage were David Stanton, director of USAID’s Office of HIV/AIDS; Allyala K. Nandakumar, chief economist at USAID’s Bureau of Global Health; and Jennifer Adams. Panelists cited health systems development in low- and middle-income countries, advances in HIV/AIDS prevention, and collaborative approaches to financing as global health successes from the last five years, but lamented stagnant human rights records in many countries, as well as rises in out-of-pocket spending on healthcare. Specifically, HPP collaborated with more than 375 partners in 48 countries and trained more than 10,000 people, nearly half of them women. The project mobilized over $520 million in support of its work, which led to the establishment of 49 distinct policy monitoring and accountability mechanisms and contributed to the adoption of 105 policies and plans in-country. To explore these achievements in more detail, concurrent sessions at the “Innovation Exchange” surveyed HPP’s work on family planning policy advocacy, HIV policy advocacy, and health financing reform. A series of “info circuits,” or roundtable discussions convened by HPP experts and colleagues,[BF8] brought participants even closer to HPP’s results related to 25 health policy topics in the project’s portfolio. These three 25-minute sessions allowed attendees to gather in small groups and engage directly with researchers about their work. Areas of focus included developing the capacity of civil society for health advocacy in Guatemala, improving Afghanistan’s ability to regulate private sector healthcare, using costed implementation plans and the DemDiv (demographic dividend) model to make the case for further investment in family planning, and helping countries tailor their responses to HIV through GeoHealth Mapping. HPP was implemented by Futures Group (now Palladium), in partnership with Plan International USA, Avenir Health, Partners in Population and Development, Africa Regional Office (PPD ARO), Population Reference Bureau, RTI International, and the White Ribbon Alliance for Safe Motherhood. For HP+, Think Well will join the previous group of HPP implementing partners.